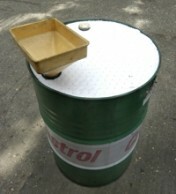 2 x 25L drum tray with container stand, 64 x 49 x 12cm, 28 litres. 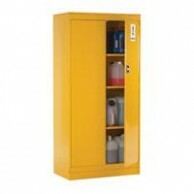 2 x 205L drum workfloor Yellow 121 litres 160 x 80 x 15cm Please contact us if you have any queries regarding this product. Our absorbent drum pad toppers will keep your drums, and barrels, clean and protect surrounding areas. Great for absorbing drips from leaking pumps and will help keep your storage area clean too. Manufactured with a pre-cut holes and fits drums up to 56cm diameter Will only absorb oil or hydrocarbon based liquids and oils and repel water. Poly Wrapped, Plain material, 56cm diameter, X5 qty, with 5L Pack Absorbency. Other sizes or colors may be available on request. Please contact us if you have any queries. If item is not priced or you have any queries then please contact us. Salvage Drums are versatile units that can directly contain solids and sludges with security. With a 1/2 turn push down lid, this ergonomically designed unit accepts bottles, cans, and 5 gal. pails. With the highest rating in the industry, this "pill-bottle" design sets the new bar for Overpacks. With a tough HDPE polyethylene design, it is weather and chemical resistant and can be stacked. Units are also nestable, which allows for ease of shipment. The wide mouth, rigid walls, small footprint and integral handles make it perfect for overpacking damaged containers, emergency response, secondary containment and medical and operating room waste destined for the freezer or incineration. Excellent for spillkits! Meets performance-oriented packaging requirements of US DOT and UN regulations. 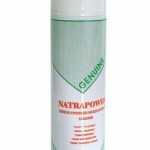 Our General purpose absorbent booms are, probably, the best choice for most industrial and commercial applications. Our socks absorb both oil and water base liquids an non-aggressive fluids. They are easy to mould and shape around equipment and machinery. Our GENERAL PURPOSE absorbents will handle any spill from many solvents to oils and common fluids (with the exception of aggressive chemicals). A complete range of oil only pads, rolls, socks and toppers for use on land or water. Our Oil Only absorbents are hydrophobic, they will repel water and only absorb oil or hydrocarbon based products.